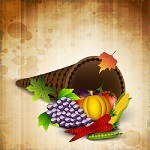 Here are some rhyming Thanksgiving riddles for kids. Every answer has something to do with Thanksgiving. How many can you get? You must eat all of it at dinner, we don't want any to be wasted. For it is so juicy and tasty, just so long as it has been basted. A fruit eaten with turkey this will help fill your belly, it's great as a sauce and especially as jelly. With the roast turkey and the cranberry sauce, we make a meal that just can't be beaten.